This front door weatherstrip kit is an 8 piece set (4 pieces per door). This set is enough for the front two (2) doors of your vehicle. The set includes the 3 perimeter weatherstrips that install on the front doors and a bellow seal that starts on the door behind the hinge. These seals are a reproduction designed right from the original parts and are made to fit your car correctly. This set will come with an instruction sheet on how to install. These are for post models vehicles, those with a frame around the door glass. 1951- Oldsmobile- Standard 88- Post styles: 2dr & 4dr Sedans ONLY. Steele's weatherstrips are made from the highest quality of soft, pliable epdm rubber compounds. This flexible, heat and ozone-resistant rubber makes it ideal for your classic car restoration. Due to the advancement in rubber chemical make-up, these reproductions are better quality and will last longer than the original rubber seals. Steele's craftsmen have designed custom-made dies to ensure a true-to-fit weatherstrip for your vehicle. The company has 100% control of the manufacturing process with headquarters and operations located on the same property in Denver, NC. Don't forget the weatherstrip adhesive! Add a 5 oz tube to your order. We encourage you to pre-fit parts before installing. These charges are not imposed by us and are not under our control. They will not be part of your order total. We cannot estimate these charges. You are responsible for paying these charges. 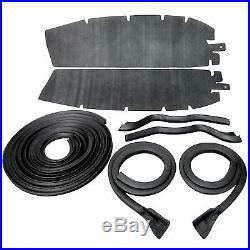 The item "1949-1952 Chevrolet Oldsmobile Pontiac Post Models Front Door Weatherstrip Seals" is in sale since Wednesday, October 17, 2012. This item is in the category "eBay Motors\Parts & Accessories\Vintage Car & Truck Parts\Other Parts". The seller is "steelerubber" and is located in Denver, NC. This item can be shipped worldwide. Manufacturer: Steele Rubber Products, Inc.